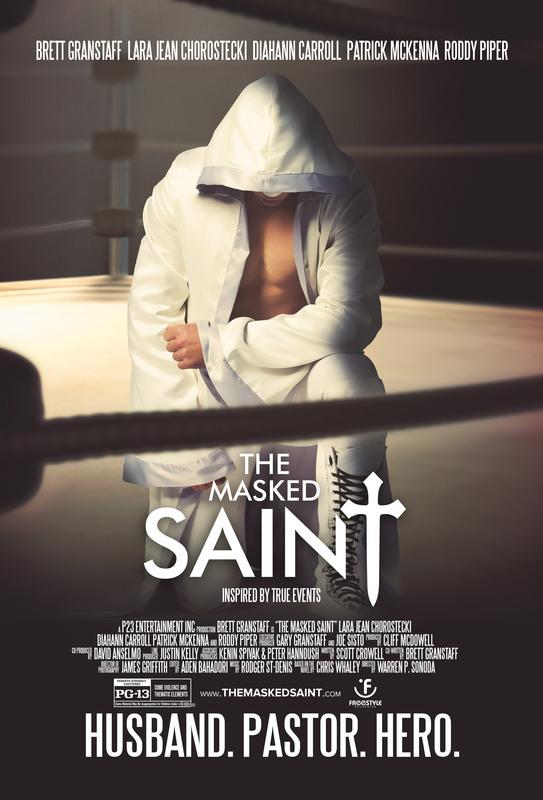 The Masked Saint, which opens in Canadian theatres this coming weekend, is based on the novel by pastor Chris Whaley and is based on Whaley’s own career as a professional wrestler in the 1980s. In the movie, after being called to a small church in Michigan, Samuels faces a shrinking congregation, dwindling finances and a hostile neighbourhood. Thinking he’s left the ring for good, Samuels ends up using his wrestling skills as a masked vigilante and then as a way to prop up the congregation’s finances. Having been disappointed by previous Christian films, I previewed The Masked Saint with some skepticism. But I was disappointed again. The film exceeded my expectations and, in my opinion has reset the bar for other Christian filmmakers. Unlike other movies in this genre, The Masked Saint presents a solid story with well-developed and believable characters. Chris Samuels isn’t a perfect pastor who has it all together. In much the same way that Eric Liddell found God’s pleasure in running in Chariots of Fire, it isn’t until the saintly Ms Edna (veteran actor Diahann Carroll) encourages Chris to get back into the wrestling ring and use his God-given talents. Still, The Masked Saint had a few weaknesses. One is in the character of Judd Lumpkin (Patrick McKenna), which comes across as more of a caricature of a controlling church board chair, than a believable character. This makes Lumpkin’s own repentance scene seem slightly contrived. Another weakness would be how some police procedures (the line-up scene) are sacrificed for the sake of increasing tension and conflict. In the end, though, the story and characters overcome any weaknesses. From producer Cliff McDowell’s home-town of Sault Ste. Marie, Ontario substituting for Michigan to the wrestling sequences, The Masked Saint is beautifully shot. And the use of wrestlers-turned-actors Roddy Piper (as the less-than-honest wrestling promoter Nicky Stone) and James Preston Rogers (as the Reaper) add authenticity to the movie. As Chris Samuels struggles with his calling and the consequences from following that calling, The Masked Saint builds to an inevitable conclusion. That’s not to say it’s a cliched conclusion – there’s still lots of room for doubt and a surprise ending right up until the final scene. And that’s what makes The Masked Saint stand head and shoulders above its peers.